Home > Guitars > Rockburn LP2 Review – Good or bad? The Rockburn LP2 is a good Les Paul copy or should you avoid it like the plague? There are a whole load of budget guitars out there, some good, some not so good. But what about the Rockburn LP2 guitar, is it any good or should you perhaps be looking at something else? The Rockburn LP2 is firmly aimed at the budget starter guitar market. Starter guitars are great because they are relatively cheap allowing you to get a taste for playing without spending too much money. The trouble is there are many guitarists whose enjoyment of the guitar started and ended with a poor quality instrument. So choosing a good quality budget guitar is quite important. Rockburn are a well established company who make good quality budget guitars. They save money on the manufacture of their guitars by having them made in countries such as Indonesia and China where the cost of production is low. They also save money on the raw materials used to produce the guitars. So you will get cheaper wood, usually basswood and cheaper electrics such as pick-ups, volume controls and pick-up selector switches. That said, although cheaper the guitar should still be playable. And this is where the problem lies, in saving cost some budget guitars are simply unplayable. That brings us quite nicely to the Rockburn LP2. This is a Les Paul copy which comes in a number of shades from black and tobacco sunburst to a rather fetching silver burst, which sadly I think is rather cool looking. The guitar body is made from basswood and the bolt on neck is made from maple with a rosewood fretboard. The Rockburn LP2 is fitted with the standard tune-o-matic bridge which is what you would expect from a Les Paul style guitar. With two humbuckers which can be accessed through a three way selector switch and tone and volume controls for each pick-up this is standard Les Paul territory. So if you like the classic Les Paul style guitar then so far the Rockburn LP2 is looking pretty good. How well does the Rockburn LP2 play? 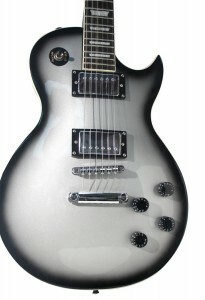 The Rockburn LP2 looks pretty good considering the price and I have to say I am a big fan of the silver burst version! Taking the guitar out of the box, the first thing that I noticed is that the guitar looks pretty good. The build quality is fine and the guitar has a re-assuring weight to it. The paint job is nice, as I say I am quite a fan of the silver burst. With a little bit of tunning the guitar is ready to go. The guitar plays well with no real issues with fret buzz and the humbuckers are ok considering the price of the guitar. The strings are very cheap but nothing that can’t be remedied by fitting a new set. The sound of the guitar plugged in is nice with a nice warm clean tone and a re-assuring growl as the distortion is cranked up. These are not top of the line pickups so the tonal range is limited but certainly acceptable for a guitar at this price point. Generally for me I have no major complaints. In conclusion I would have to say that if you are looking for a bulk standard Les Paul style guitar at a very reasonable price then the Rockburn LP2 is a pretty good option. It is cheap and that should be borne in mind when looking at the guitar. You are not going to get top end quality with all the trimmings but then if you want that you are going to have to spend a lot more money. The acid test for me is would I have been happy with this guitar if I was starting all over again. I think the answer would have to be yes this is not a bad guitar if you are prepared to accept the limitations. 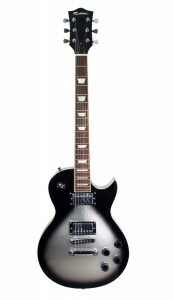 Therefore if you have a tight budget and want to give the guitar a go the Rockburn LP2 Electric Guitar is a pretty good place to start.